DeSantis knows that simple accessories can make all the difference when it comes to making the job easier. 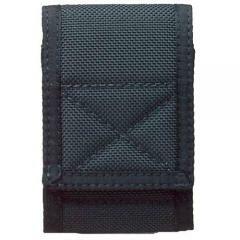 The N08 Nylon Duty Pager/Camera Case is a straight-forward black nylon holder with a Velcro® closure that guarantees secure retention of contents. DeSantis' duty case is compatible with both pagers and compact digital cameras, including Motorola pagers and Nikon's Coolpix 3100/3200 and the Canon Elph Powershot S200/S230. The N08 model offers convenient carry for flexible wear, offering a steel spring clip or a tri-folded belt loop options. How wide is the belt loop? Or what size belt will it fit?